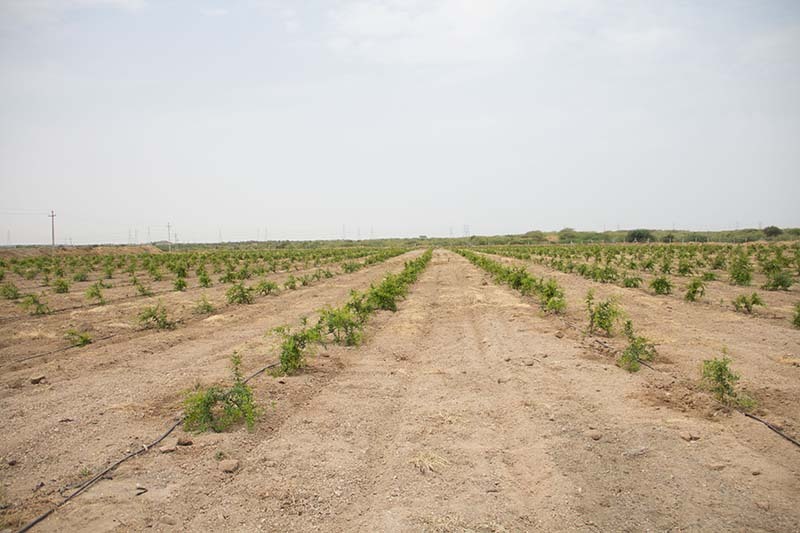 The Farm Area is of 70 Acres and soil condition is very dry in summer season and quite adequate in winter season. The crop is pomegranate (8000 bushes) and is watered through water tank that holds 50,000 litres. The irrigation pipes from the source were 4” to peripheral area. 2” pipe were laid in rows and from it, 16mm were dispensing to all the pomegranate bushes. Mr Patel’s dilemma is, his annual consumption of water and yield quantity and quality does not leave much margin in his finance to re-invest. He has manually driven irrigation system to all his 8000 bushes of Pomegranate but it does not equate in favour of good quality of yield. Aardra Systems Loaned and fitted the system for a Year and the outcome was significant both in economy water and yields quality and quantity. The economics of saving water was clear up to 65% and then the cost associated with acquiring water per litre was down as well. The quality of the plant was very striking and thus it produced fruits that were on an average of 350grm. In the market the fruits were dealt on the size and weight and both proved to be a good investment. Mr Patel’s verdict was that the system is a clear winner to him and farms predicament.